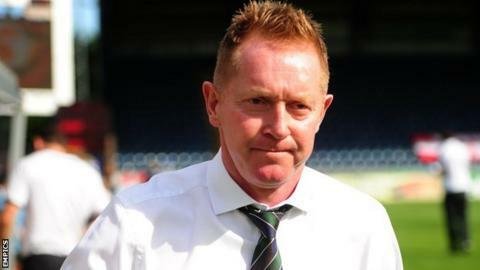 Oxford United manager Gary Waddock says there is "a losing culture" at the club and has promised radical changes to the squad in the summer. The U's have lost six of the seven games since Waddock took charge of the League Two club in March. Their latest loss - a 2-1 defeat by Accrington on Saturday - ended any faint hopes of making the play-offs. "That [loss to Accrington] is unacceptable for everyone associated with the football club," Waddock said. "For the supporters, the fans, our chairman, our directors to witness that is unacceptable." Waddock says he has the support of the chairman Ian Lenagan to reshape the squad and added he has been disappointed with the attitude of the players. "We did not show up, that is not the type of team I want to put together," he told BBC Radio Oxford. "It is not the type of team our fans want to watch and it will be addressed. "Decisions will be made and we will go into the new season hopefully with an opportunity to change the culture here because we have a losing culture. We need to address that. "There will be big decisions because what I've seen since I've been here is not unacceptable."